Neck pain is a common problem that seems to be growing worse in our modern world that is so tech-oriented. How can you take care of neck pain without reaching for that bottle of NSAIDs (which can have many side effects if you use them long-term)? We’re going to provide you with some self-care tips to help you reduce and relieve neck pain at home. 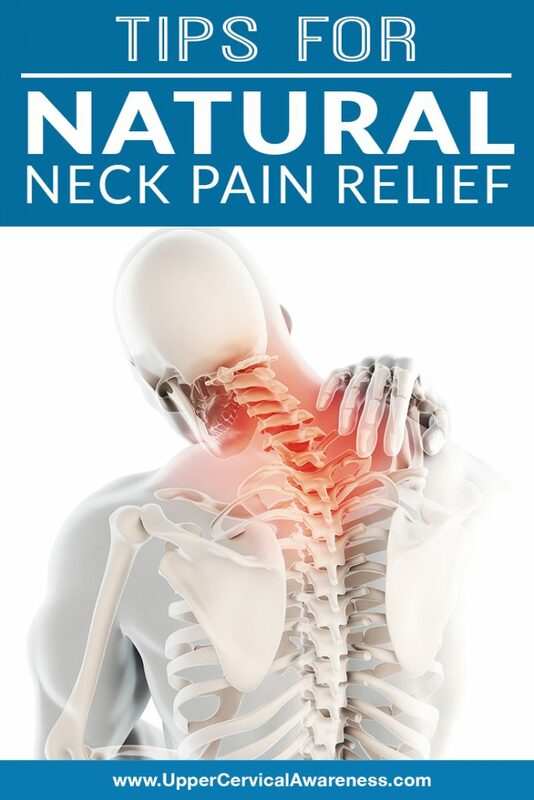 Then we will present a natural therapy that has helped many people to break free from neck pain for good. This is particularly important if you find that you wake up with your neck pain at its worst. There are a number of factors related to sleep that can be leading to neck pain. For example, your sleep position or your pillow choice could be affecting your spine. Here are a few tips depending on the way you prefer to sleep. Back sleepers – This is the best sleep position for your neck. Just be sure that you are not using a firm pillow or too many pillows. If you prop your head up too high, you will spend the entire night with a forward head position. This can lead to structural changes in the neck and pain. Side sleepers – This position can also be good for the neck, but you have to do it right. Have your pillow be a medium firmness. You have to prop your head up a little more to make room for your shoulder, but again, propping too high is not good. Stomach sleepers – This is the worst sleep position for your neck. Since you can’t breathe sleeping facedown, stomach sleepers need to have your head turned to the side all night. That is rough on the structures of the neck. The best decision is to work at changing your sleep position. You can use a body pillow to help yourself become a side sleeper while still maintaining the feel of being on your stomach. The structures of the spine are supported by soft tissue. When the muscles are strengthened through regular exercise, this can help to keep the vertebrae in proper alignment. Exercise also helps to improve blood flow, and blood flow is vital to maintaining the spongy discs that keep the vertebrae from rubbing against each other in good condition. Core exercises are good for your spine in general, but you also want to include exercises that strengthen your neck muscles. Cardio can help to improve blood flow. You’ve probably been told to stand up straight since childhood. It’s sound advice. Your posture can play a big role in the health of your entire spine, your neck in particular. Where are some places that you should pay particular attention to your posture? At the office – Make sure monitors are at eye levels so you don’t have your head tilted down all day. The quality and position of your desk and chair are also important. Don’t forget to take breaks where you can stand up and stretch or walk around a little. While driving – Adjust your seat and mirrors properly. It’s impossible to maintain great posture while driving so be sure to take a break every hour or two when on a long drive. Even if you just pull over at a rest area to walk around a little, it can help keep your spine from being locked in a stressed position for hours at a time. While relaxing – One of the places we rarely pay attention to posture is when relaxing. Whether you are sitting on the couch watching TV or using a mobile device to binge watch your favorite show, make sure that you are not sitting hunched over and that your neck is straight. When lifting – Always bend at the knees to lift and carry a heavy load as close to your body as you can. If something is too heavy for you to lift alone, be sure to get help rather than trying to muscle through it. If you have never heard of upper cervical chiropractic, that is probably because there are only about 3,500 practitioners of this subspecialty around the world. What makes upper cervical chiropractic special and how can it help you with neck pain? Focused – Upper cervical practitioners only adjust the top two bones in the neck. Since these bones balance the head, even the slightest of misalignments can cause changes in the spinal structures going all the way down to the lower back. Therefore, keeping these two bones in place is important for overall spine health and can help neck pain. Precise – Diagnostic imaging is used to pinpoint misalignments down to hundredths of a degree. In this sensitive area, every fraction of a millimeter counts, so these precise measurements and calculations are important. Low force – Because adjustments are focused and precise, they are also gentle and safe. Most practitioners use either gentle pressure or an adjusting instrument. As a result, there is no popping or twisting of the spine. Upper cervical chiropractic is safe for all ages and health levels, so you can even use it to help improve the health of your new baby or an aging parent. Bring the whole family along! If you are suffering from neck pain, upper cervical chiropractic may be the secret to long-term relief. Get ready to say goodbye to NSAIDs and say hello to improved spinal health. Find the practitioner nearest you to get started.